Kick off your visit on the 22nd (Thu): discover the magic at Disney's Blizzard Beach Water Park and then admire the landmark architecture of Stetson Mansion. Here are some ideas for day two: find something for the whole family at Walt Disney World Resort. To find where to stay, photos, ratings, and other tourist information, go to the Orlando road trip planning website . Newark to Orlando is an approximately 8.5-hour flight. You can also drive. In November, Orlando is warmer than Newark - with highs of 78°F and lows of 62°F. Cap off your sightseeing on the 24th (Sat) early enough to go by car to Miami. You'll discover tucked-away gems like Vizcaya Museum and Gardens and Holocaust Memorial. Step out of Miami with an excursion to Sawgrass Mills in Sunrise--about 42 minutes away. 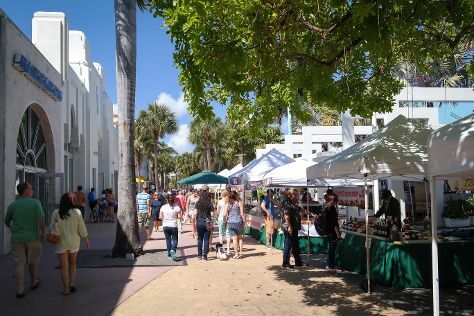 There's much more to do: tour the pleasant surroundings at South Beach, buy something for everyone on your list at Bayside Marketplace, explore and take pictures at Lincoln Road, and admire the landmark architecture of Art Deco Historic District. For more things to do, traveler tips, maps, and other tourist information, go to the Miami trip itinerary planning app . Traveling by car from Orlando to Miami takes 4 hours. Alternatively, you can take a bus; or take a train. Traveling from Orlando in November, Miami is a bit warmer at night with lows of 70°F. Finish your sightseeing early on the 26th (Mon) to allow enough time to drive to Islamorada. Start off your visit on the 27th (Tue): cast your line with a fishing tour, then look for gifts at Bella Sol Fragrance Bar and Gifts, then take a tour by water with Boat Tours & Water Sports, and finally indulge your thirst for a good beer at Islamorada Beer Company Brewery and Tasting Room. Get ready for a full day of sightseeing on the next day: view the masterpieces at Old Road Gallery, look for all kinds of wild species at Florida Keys Wild Bird Rehabilitation Center, view the masterpieces at Lobster Trap Art Gallery, then glide through the air with a parasailing or paragliding tour, and finally sample the tasty concoctions at Florida Keys Brewing Company. To find where to stay, photos, ratings, and more tourist information, use the Islamorada trip builder app . Traveling by car from Miami to Islamorada takes 2 hours. Alternatively, you can take a bus. In November, plan for daily highs up to 82°F, and evening lows to 72°F. Wrap up your sightseeing on the 28th (Wed) early enough to travel back home.